So last night Mr. T, my beau, and I went to The Green Room for my birthday dinner. To be honest, the only reason we decided to go there was because I had a $40 Living Social deal from a few weeks back. Well let me tell you, The Green Room is now one of my favorite restaurants in Greenville! Our Drinks were great and reasonably priced. 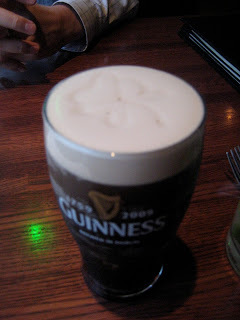 The Guinness even came out with a little shamrock on top of the head, an extra touch that I always love. We then ordered our appetizer, the caprese bruschetta. (Not pictured, sorry I'm still new at this and forgot to take a picture before I dove in) The bruschetta was amazing, it had a perfect tomato/olive ratio. The toast points were great, not sopping in EVOO or butter. And it came with creamy fresh mozzarella cheese as well. Overall a tasty appetizer that was light, so it didn't take away our appetite before the meal. A big plus in my book. As for our entrees, Mr. T ordered the ribeye. 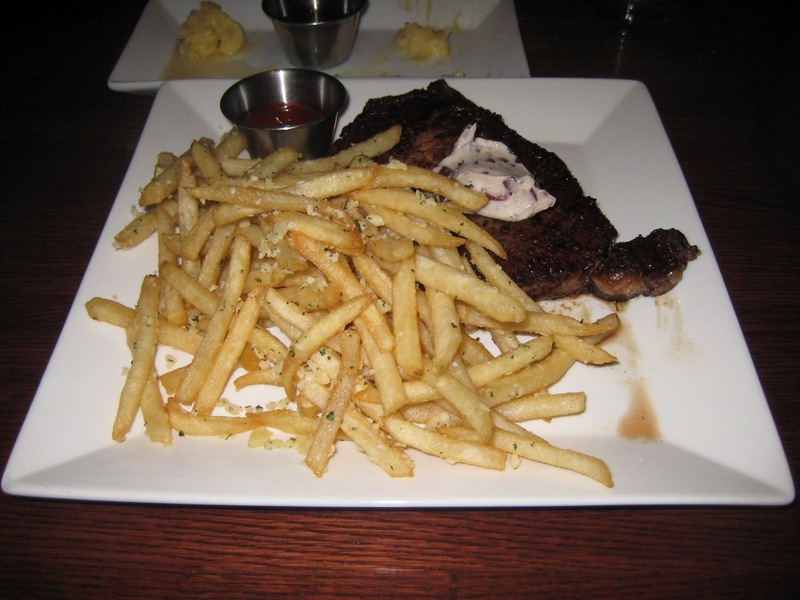 It came with a red onion steak butter and parmesan truffle fries. Yum! I ordered the TGR meat loaf. A great gourmet twist on a classic comfort food. The meatloaf had a Sweet Chipotle glaze and was accompanied by cornbread, a three cheese jalapeno macaroni, and creamed green peas (which I substituted for haricots vert). SOOO GOOD. And as for dessert... a Blackberry Crème brûlée with champagne to toast. A complimentary birthday surprise orchestrated by Mr. T and the friendly staff. If the food didn't win me over, the restaurant itself would have. It's a quaint place, beautiful exposed brick with very few tables inside. It reminded me a lot of a Manhattan restaurant with its size and vintage charm, sans the terrible crowd and $15 drinks. If you decide to take my advice and go, I would recommend making reservations since it is a smaller place, and ask for window seat! There are only two of them but its one of the best seats in the house. Welcome from the Reedy River Recessionista!